“It’s a useless cup and I wanted to get rid of the bloody thing,” says Spithill. 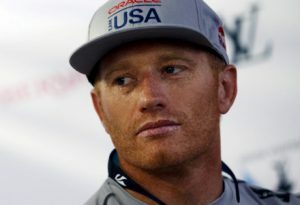 Oracle Team USA skipper Jimmy Spithill has blamed his team’s America’s Cup loss on not wanting to win. “It’s a useless cup and I wanted to get rid of the bloody thing,” he told media today, breaking his silence for the first time since the initial post-match press conference. “The past seven years have been a nightmare. I don’t know who designed it but it’s obvious they never used a cup in their lives. Spithill said the problems first came to light when the Oracle team tried to drink champagne from the Cup following their 2010 win. Spithill said the problems only grew once he got the Cup home. Spithill said his frustrations with the Cup peaked in early 2013 when he tried to use it to make a mug cake. He said he was looking forward to losing the Cup in 2013, and almost succeeded. However, when Emirates Team New Zealand were up 8-1, Oracle boss Larry Ellison promised that if Spithill claimed victory, he’d keep the Cup in one of his garages. “Didn’t bloody happen though, did it?” Spithill said quietly while carving an AC/DC logo into the desk. Since then Spithill attempted to use the Cup as a travel mug (“Doesn’t have a lid, doesn’t fit in the cup holder”), for baking measurements (“It’s not even an actual cup”), and as a coffee mug at the office (“Someone crooked fucker always thieves off with it”). Spithill also noted that the Cup is not dishwasher or microwave safe and doesn’t fit under an espresso machine. Spithill said the team had tried hard to lose every race in the 2017 regatta. Apart from one accidental win, he was happy with their efforts. “Every day I just try, I put everything I have in to getting the result. Emirates Team New Zealand helmsman Peter Burling said the kiwis hadn’t yet decided what they’d do with the Cup, but were entertaining offers from the Te Papa bagcheck counter and a Hamilton McDonald’s, for display in the playground. He added that after “all the hubbub” of the past few weeks, the team was looking forward to a return to the normality of New Zealanders not caring about sailing.